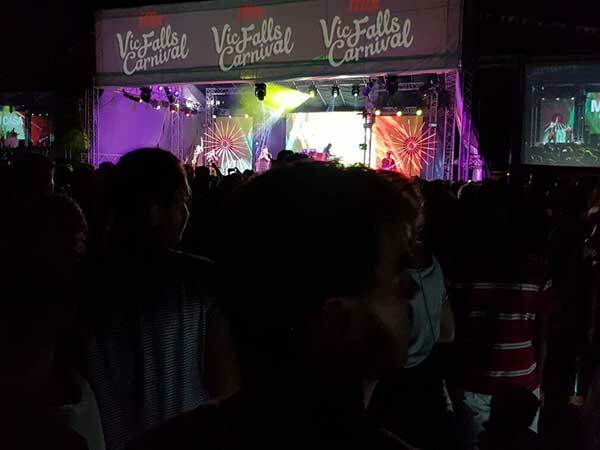 From the 29th of December until well into the early hours of the 31st, the atmosphere in Victoria Falls is electric, as though the very air with breathe is quivering with the excitement Carnival goers feel. Music vibrates through crowds of dancing bodies, the bar teems with thrilled partiers, and the entire sky is awash with colors as stage lights flood the night. Amist the craziness the carnival is famous for, Mi Casa could not look more comfortable. Dr. Duda, J’Something, and Mo-T have a platinum selling debut album, 3 South African Music Awards (SAMAs) and thousands of fans and followers, yet this dynamic trio could not be more humble and down to earth. As I pushed through the throngs of euphoric people and made my way towards the backstage area, my heart thumped as the questions I had prepared raced through my mind like a flurry of birds. However, when I reached the group, their humble, positive and introspective energy washed away any nerves that still jittered through my veins. Mi Casa did not behave as three big shot celebrities that people can’t interact with- their wit and good nature holds a mirror up to the quintessential feel good music that they produce. The name of their group is another reflection of their appreciation of their fans and the media who they believe are key in getting them to where they are today. Mi Casa su casa means my house is your house, and J-Something explains that they want their listeners to feel that this group is your group as much as it is theirs- my house is your house, my music is yours too. The chemistry between J-Something, Mo-T and Dr Duda is as evident off stage as it is on. They bounce off each other, laugh and tease the way a trio of friends who have grown up together would. When asked what their first thought was when driving into Victoria Falls, they answered “Beautiful” in unison. I had always imagined that they had been an incredibly talented group of friends growing up, but their union was actually a musical twist of fate. One evening, Dr Duda was djaying an event in Sandton when Mo-T’s brother called him to come and play with the DJ. J-Something joined the two on stage and the rest is history. Dreams were realised, lives were transformed and life long friends were made. With Mo-T’s jazz background, Dr. Duda’s gospel background and J-Something’s soulful background, the world was introduced to a fusion of music that everyone wants to sing along to and has to dance along to. 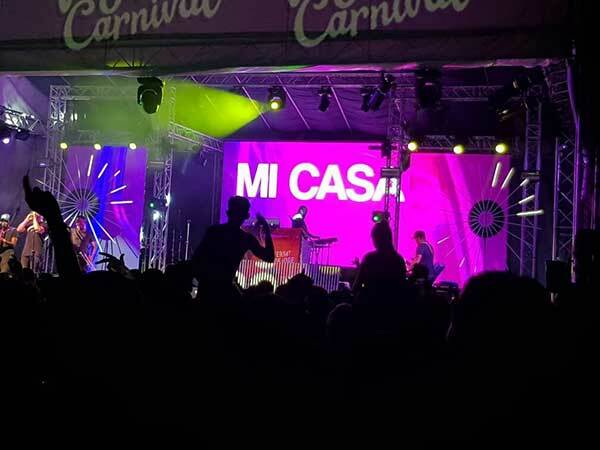 When Mi Casa took to the stage, people were not just watching the performance, they were involved in it. Each song sent the crowd further into a frenzy, and even the few that were not familiar with the group were losing their minds to the sounds pouring through the speakers. As each new track began, I was determined that it was my new favorite song. That is, until the next one. When they played Your Body and Jika, it felt as though a flash mob had erupted on the dance floor. Thousands of feet pounded onto the soft grass while hands were flung into the air and bodies danced to the music. They could have played their set on repeat for the entire carnival, and I doubt a single person would have left the dance floor. 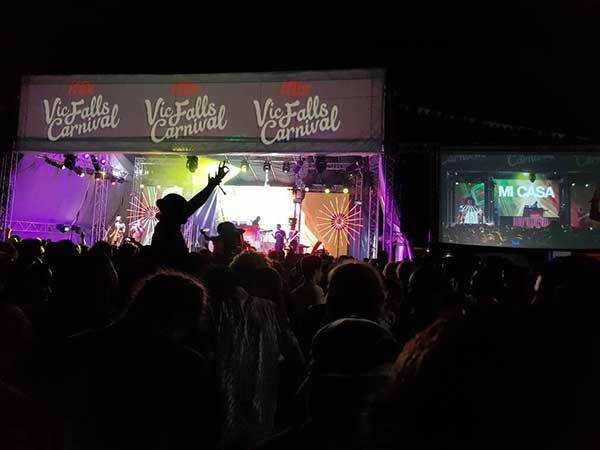 So, there are two things to add to your bucket list now- watch MiCasa perform live, and come to the Victoria Falls Carnival. It is the best way to guarantee an incredible New Year. Happy 2018 everyone! We are proud to be featured in this progressive, positive article in Vanity Fair, March 2018. The story features the Wild Horizons Elephant Sanctuary at The Elephant Camp and highlights the positive impact the Tourism Industry and Responsible Travel can have on conservation. Imbabala Zambezi Safari Lodge has been peacefully planted within the jaws of the wilderness. If you didn’t know what you were looking for, you may miss this natural oasis that erupts between the navy stretch of the Zambezi River and the towering trees in the National Park. The lounge and dining area have been designed to complement the easy flow of nature. From the open plan area, one can survey the a mosaic of green and brown trees flung like a duvet across the landscape, interrupted only by the shimmering snake of the Zambezi. The natural hues of the chalets blends in seamlessly with their environment. There is enough space between each room to ensure an intimate yet private family vacation. A hammock swings lazily in the breeze on each verandah, the perfect location to peacefully observe the grazing warthogs and impala, or recline with a book. A wooden decks sits proudly on the green lawn, and once the sun has set and the fire has been lit, family and friends are drawn to the crackling flames. The gentle calls of the preying night owls mingle with guests laughter, as there is no place more heavenly on earth than around the glowing embers beneath a carpet of stars. In the afternoon, when the African sun beats down, a table laden with iced tea, coffee, scones and cakes is set up from the lawn where guests can share stories while they plan the next activity. The camp is a stone’s throw away from the Zambezi, and there is nothing more relaxing that soaking up the sun in the refreshing oval swimming pool whilst watching the shards of light dance across the surface of the river. A gin and tonic or icy Zambezi Lager in hand completes the the picture wonderfully. Between the pool and the expansive green lawns that beg to be run around on, Imbabala is a childs paradise. Once the sun has set and stars flood the sky, the hippo enjoy the luscious green grass as much as children do, grazing peacefully by moonlight. Their tracks can be seen dotted in the sand as they wear a path between the water and the grass. In the late afternoon, guests follow this same path to the waters edge where a pontoon and cooler box await. The river is a source of water for a multitude of animals, and as the boat leisurely explores the channel, a diversity of buck can be seen grazing, keeping an inquisitive eye on the boat. Crocodiles stretch out on the sun soaked rocks, so comfortable in the warmth of their spot that the rarely even register the boat as it glides by just meters away. However, the hippo are not only interested in the guests, but seem determined to show off for their spectators. A grunt and a snort will catch your attention, but their gaping mouths will hold it. Game drives at sunrise and sunset reveal further hidden treasures of the National Park as guests accompanied by an experienced guide explore further away from the river. A Land Rover takes passengers beneath a canopy of trees along a bumpy road that s frequented by more wildlife than vehicles. Lion, elephant, zebra, and kudu are just a few of the possible sighting while on these trips. The game drive rumbles to a stop in the embrace of nature, so that guests can climb out to marvel at the setting sun. Dinner is served in the lounge area, and though you are tucked beneath the thatch roof, the night air breezes through the open space, carrying the murmers of the bush. Large dining tables are laid out so the whole family can sit together and enjoy a delicious meal, garnished with herbs from the camps vegetable garden. There are very few places that manage to strike a balance between the excitement of adventure and the relaxing quality time that families need. However, this is exactly what Imbabala promises, and it is this unique balance that makes the safari camp your ideal family getaway. Vanity Fair, March 2018. We are proud to be featured in this progressive, positive article in Vanity Fair, March 2018. The story features the Wild Horizons Elephant Sanctuary at The Elephant Camp and highlights the positive impact the Tourism Industry and Responsible Travel can have on conservation.